Upcoming Events | The Business Value Forum, Inc.
Bolduc has an A.S. in Criminal Justice, B.S. in Sociology, M.A. in Business Technology/Human Resource Development, M.S. in Strategic Studies, and is currently a Doctoral Candidate at Liberty University in Strategic Leadership. On 15 January 2019 he received a Doctorate in Humane Letters from New England College for distinction during his military service. Beyond his various positions and awards, nothing brings more meaning to Bolduc’s service than his latest mission with the support of his wife Sharon to combat the stigmas around post-traumatic stress disorder (PTSD), as one of the few senior military officers, and, at the time, the only active duty general officer on record, to openly discuss his own struggles with PTS, Bolduc has used his leadership position to change the conversation to one of understanding and acceptance through his own experiences. 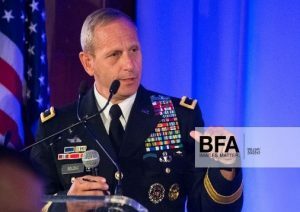 Dubbed “Captain America” and “Everyone’s General” by his fellow officers and soldiers, Bolduc always put country first, and now looks to continue his service off the battlefield sharing his leadership mantra of “People, Family, Mission” and his personal experiences with mental health to continue his leadership journey and help educate others. This promises to be a most unique, interactive, and educational program.